So you’re going about your day. Things seem to going okay. Woke on time, had breakfast, maybe got a workout in, even spent some time in prayer and scripture, and then you begin your day. Things seem to be going good. Maybe sitting in some traffic heading to work, but no big deal. As things progress, something happens. All of sudden you feel this tremendous sense of anxiety or a sense of frustration and anger that you just can’t explain. Everything crumbles all at once and you feel like the day just got shot to hell really quick. What in the world just happened? You can’t explain it, but still feel this feeling of negativity or even anger and you don’t know why. Have you had this feeling before. That feeling of unexplained anxiety, frustration, anger, or worry. I know I have, and it comes out of the blue. The answer to this is really simple, yet very big. We are at war. There is a never ending, continuing battle that is ensuing in this life and the battle is over our hearts. God is in constant pursuit of us. He has devised a full plan to pursue our hearts and has been on that path since man fell. On the flip side, there is an enemy, Satan, who is also after our hearts, but with a different purpose. Jesus explains that his purpose is to steal and kill and destroy our hearts. He wants to destroy every aspect of our connection with God’s heart through lies, deception, temptation, and even infiltrating us with worries, fears, anxiety, and anger. It is a battle that is constantly happening in this life and no matter how much closer we get to God, the enemy is constantly trying to pull us back. Our lives are constantly full of things going on. We live in a busy society, and we seem to to always have something going on. In the book, Waking the Dead, John Eldredge says it like this, “Ask the people you know how things are going. Nine times out of ten will answer something to the effect of “really busy.” I know I’ve thrown that answer out and hear it all the time. With so much going on, we don’t see this battle even when it’s right before our eyes and hearts. We get filled with so much from all directions that even when we don’t notice, it can come crashing down and those moments happen where it all hits us at once. It’s almost like, the enemy was blinding us and then when we least expected it, he pounced. I know it sounds crazy, in some sense, but I think it is very true. Satan is always out to destroy our connection with God. It all started in Eden and continues now with even more fury now that we are under Grace through Jesus. Satan, knows he has lost and is going to try to take as many down with him has he can. Many of us have lost site of this. I certainly did for a long time. Actually, I can honestly say that I did not know about this battle for a long time. I did not have a real glimpse of the real struggles we all face every single day and no matter how much we try, it is always there in some form or fashion. John Piper said, “There is a war going on. All talk of a Christian’s right to live luxuriously “as a child of the King” in this atmosphere sounds hollow — especially since the King himself is stripped for battle.” The battle for our hearts will always continue until Christ returns to destroy the evil one for good. We must always remember this and be ready to combat the evil when it comes and know that God is always ready to battle for our hearts as well. This entry was posted in 4 Stream Blog, Spiritual Warfare and tagged 4 Pillars, Adversity, Spiritual Warfare on October 20, 2014 by Richard Clinton. It’s interesting to know and see how difficult it can be for people to trust God. We run through so many different circumstances in our lives that, in our fallen nature, we are turned and question Him when times get difficult. His love is right there for all of and never failing though. As I’ve written time and again, no matter where we are in life, God is always pursuing us. It is never failing and never ending. If you study scripture and see all that has happened since the beginning, you can see that what ever God wills to happen is going to happen. We His people turned away from Him, he turned away but only for a period of time and them was right back with Him. The purpose is for everyone to know that He is the Lord and He is always there for us if we just trust in Him. Psalm 18:30 says, “God’s way is perfect. All the Lord’s promises prove true. He is a shield for all who look to Him for protection.” Think about that for a minute. God’s way is perfect. God is the love, strength, courage, wisdom, power, and everything else rolled into one. He is the source of all creation. When He declared in the beginning that His creation was good. He created perfection. He created us to also live in His perfection and glory. Even when struggles arise in our lives, know that God’s will and perfection will shine through our lives if we trust in Him. I know it can be so easy to turn away. Mother Teresa said, “God will never, never, never let us down if we have faith and put our trust in Him. He will always look after us. So we must cleave to Jesus. Our whole life must simply be woven into Jesus.” It’s so simple when you thing about it. Jesus came to save us from our sins and set us free from the grips of satan and death who is always trying to deceive us and destroy our hearts. Jesus said that Satan’s goals is steal, kill, and destroy us. We see this everyday with junk that we face and we see others facing. As Mother Teresa said, God will never, never, never let us down. We need to trust in His perfection. I know often times that my writing may seem to be a little on the serious and gloomy side when I focus on pain and struggles. I do this because it is very real. I have have been through this and we all have. I believe those struggles are a sharp reminder that we need to hold tighter to God and remain strong in our faith. Don’t let the pain and sorrows of this world turn you away. When those times come, hold tighter. I know how challenging it can be, but don’t let go. When you hold the tightest, that’s when the enemy pulls at you stronger. Trust in God’s perfection, always! 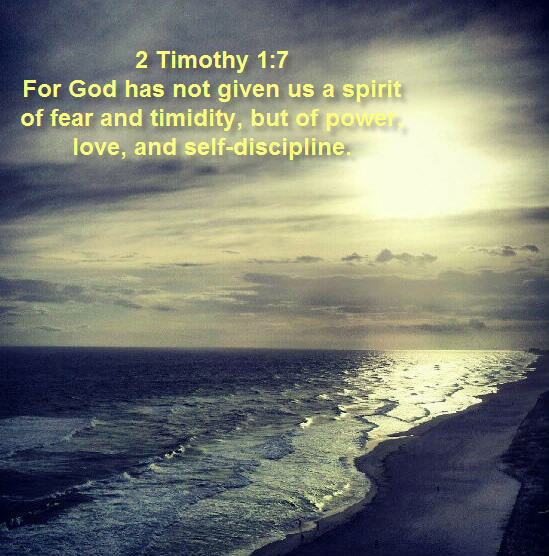 This entry was posted in 4 Stream Blog, Spiritual Warfare and tagged 4 Pillars, Adversity, faith, Spiritual Strength, Trust God on August 12, 2014 by Richard Clinton. I’ve written often about the pains and struggles that we all face in this world. It doesn’t matter who you are, there is not anyone who has not had to face trials and sorrows, pain and suffering, temptation and sin. It’s a simple fact of our fallen world. I know there are some of you right now, who are going your own personal hell where it feels like no matter how hard you try, you just can’t seem to see the light at the end of the tunnel. You find it difficult to see where God is at work in your life. You could be someone that has been full of faith, prays, and walks with the Lord, but then something comes along that just knocks the wind out of your sails. I’ve read the book, “Heaven is For Real” and my family and I sat and watched it yesterday. The Burpo family was going through some serious struggles of their own. This was a family where the Dad and Husband is a pastor and they are all about their faith. Boy does it get tested though, especially when their son falls ill and nears death. Often times, the more locked into our faith we are, the tougher the struggles are and the harder and faster the arrows come to pierce our hearts. My pastor, Tim, said in his sermon yesterday, that if you are locked in your faith, the devil is more ticked off now that your heart has turned to God, so he will come at you even harder. This is so true too. In my faith walk these last few years, there are times where I just get bombarded with junk, whether it’s how I respond with my attitude, junk from my past trying to creep back, or new struggles and temptations that try to pierce into me. I have to fight just as much. We all do. There’s one thing I’ve learned for sure with all of this, however. The best thing we can ever hope to do, no matter how hard things may get is keep our eyes fixed on God. David said in Psalm 42, “Why am I discouraged? Why is my heart sad? I will put my hope in Go! I will praise Him again – my Savior and my God!” No matter how much junk tries to eat at us in this life, we have to keep focused on God. Our hope lies in our faith in Jesus Christ. Because of the love of God shown by the blood of Christ we have overcome just as Christ overcame. We are already victorious through Him! In my church we have been going through the book of 1 John. 1 John 5:4 says, “For whatever is born of God overcomes the world; and this is the victory that has overcome the world-our faith.” Our faith gives us victory and sets us free if we can keep our hearts fixed on God. I ponder on this daily when I sit in my Scripture reading and prayer time or just when I am wandering through the day thinking. I think just how awesome God’s love is for everyone of us. I can’t think or fathom anything greater than the love of God. I used to not ever think about this. God would cross my mind, but never in such a way that I just sat in awe of His glory and love. We are in a constant war in this life. As I’ve said before, God is always pursuing our hearts to turn to Him, but the adversary is trying to use this world and his demons to attack us daily. Trying to eat at our souls and our hearts to make it impossible to keep our hearts fixed on God. Know that through Christ you are made victorious. There’s nothing more freeing than to know that. Because of our faith, we are born again of God and are His children. His love will never fail or abandon us. Romans 8:39 says, “No power in the sky above or in the earth below – indeed, nothing in all creation will ever be able to separate us from the love of God that is revealed in Christ Jesus our Lord.” Meditate on that. How awesome is that to know. Yes, we will tested and attached constantly in our life. Sin will always try to win out. But if you are faithful and in those times of struggle keep your hearts and thoughts fixed on God, know that He is always there to pull you through. There’s a framed picture in the entry way of my home that says, “The will of God will never take you where the grace of God will not protect you.” God will never abandon you to this world. Even if it feels like all hope is fading, that’s when you need to lock in more. The Christian life is never rosy and perfect. John Piper said, “There is a war going on. All talk of a Christian’s right to live luxuriously “as a child of the King” in this atmosphere sounds hollow — especially since the King himself is stripped for battle.” We are victorious in Christ because of the unfailing love of the Father who has never stopped pursuing us. He is constantly ready to go to battle for us. This entry was posted in 4 Stream Blog, Spiritual Warfare and tagged 4 Pillars, Adversity, Jesus Christ, Spiritual Strength, Victory In Christ on July 28, 2014 by Richard Clinton. Many of you have heard the quote from Saint Irenaeus that says, “The glory of God is man fully alive.” I use that quote as the banner on this site and on my Facebook and Twitter pages. It is a powerful statement that speaks to what it is we are created for in living out God’s purpose of glorifying Him through our own lives. What does this statement mean to you. Many will look at it and shrug their shoulders at it thinking it’s just another cliche statement that doesn’t carry much weight. If God is really about us coming alive, then why do we find so much trial and difficulty in our lives that seem to draw us back into a world of heartache and difficulty. We get bombarded with so many challenges day and night that it becomes difficult for many to see just where God is working. What I’ve come to realize is that all of this difficulty and struggle comes about because we are born into a world that constantly at war. We are faced with a world that is full of struggle and difficulty, anxiety, worry, and pain. Since the fall of man in Eden, God has been constantly waging war against Satan and his demons that are constantly trying to overtake our lives and turn us away from God. In Exodus 15:3, the Hebrews proclaimed that “The Lord is a Warrior.” God has waged a continuing battle to win us back every since the fall. What is He battling for? For our hearts and that we can turn to Him and finally achieve the purposeful life we were created for. Now for many, they may see that our faith in Christ grants us life in Heaven. They miss a key part of what eternal life is about. Eternal life begins now. By our faith in Christ we are open to eternal life and fully our full design. That does not start after we leave here, but it starts now on this earth. Eternal life means always living, not living after we die. Jesus came with the promise of life. In John 10:10, Jesus says, “The thief comes only to steal and kill and destroy; I have come that they may have life, and have it to the full.” Through Christ we have a chance to defeat the evil in this world and beginning to come alive through Him. Now back to the war I was talking about. God has been waging a war for us since the fall. We face so much difficulty in this world because we face an enemy that is trying to always pull us away from God. You see it today in the media as people are so bent on being in this progressive society and discounting anything that is spoken from The Word. That is Satan at work. Jesus told us that we will continue to have trials and sorrows in the world. Through our faith in Him, we can overcome all of that because He overcame this world and stole the keys of hell and death and was risen to new life securing our rebirth. We are going to be continually at war in this life. Don’t let struggles that you face pull you away from your faith. I know that it will be easy to turn away. We’ve all faced struggles that make it difficult to see where God is at work. Trust me, He always is at work and will never stop fighting for us and pursuing our hearts. That’s how much He loves every single one of us. We can come alive through Christ and start living out exactly what we were created for in the eternal life that begins now through our faith. This entry was posted in 4 Stream Blog, Spiritual Warfare and tagged 4 Pillars, Adversity, Come Alive, God's Purpose, Jesus Christ on July 12, 2014 by Richard Clinton. How many of you have had times where you feel like there is just not any hope of positive change coming? You had circumstances come across your life that make you feel like all hope is lost. I think it’s safe to say that nearly every one of us had. I know I have had my moments where I felt like things were just pointless. I spent a year wondering what actually mattered in life. This kind of feeling can come when we lose someone in our lives as I did or maybe you’ve hit struggles with your work or family situation and it seems things just won’t get better. What I can personally testify too, is that no matter what your circumstance is, no matter how difficult things may get in life, we have a hope and light in front of us. We have a God that we can always lean to for guidance and strength to battle any difficulty we may face. I read this quote today. “Hope fills the afflicted soul with such inward joy and consolation, that it can laugh while tears are in the eye, sigh and sing all in a breath; it is called “the rejoicing of hope” (Hebrews 3:6).” – William Gurnall. Our hope lies in Christ who came by the Father’s Grace to save us and give us hope in the promise of entering God’s Kingdom. I don’t know about you, but with all the suffering and trials and tribulations that we have coming our way in this life, I take great joy in the hope of the promise of when Christ returns for His Bride. Now I am sure people may ask, I’m a Christian, why do I have to go through these difficulties in life. Why did I lose my Dad so suddenly, as was my case? Why did I lose my job? Why can’t I get ahead and provide for my family? Why am I stuck in this world of addiction that just eats at me? Why do have any struggles at all? Simple fact is folks, it comes with this world. Christ told us, that in this life we will have trials and tribulations. Difficulties will come our way throughout our time in this world. Due to our fallen state, we will continue to face these struggles. We have hope however, because we have a Father that from the very beginning has been pursuing us to win us back and now our hope and our place is secure because Christ has overcome this world (John 16:33). He overcame and now is preparing a place for the faithful at the wedding feast and He will be returning. What a cool feeling that is. We may suffer through difficulties. We may have struggled with our own sins in this life, but we are always being pursued and if we hold t our faith, our place is secured in the Kingdom. Hebrew 3:6 says, “But Christ, as the Son, is in charge of God’s entire house. And we are God’s house, if we keep our courage and remain confident in our hope in Christ.” Remaining confident in our hope and keeping our courage is holding our to our faith and leaning to Christ through our struggles. I used to not speak this way. I went through an entire year, where I tried to keep faith, but I didn’t know God well enough and therefore it made my faith real struggle after I lost my Dad. I speak to this hope with great confidence now. We always have hope and light in front of us. God is always pursuing us and reaching out for us to draw us back to Him. He will go wherever we are to pursue us. Think about it. His love for us is so great that He was willing to let Christ take all of the punishment and judgement for our sins. He took on himself all that we deserved. That’s Grace and that’s so awesome to know. God is always there folks and we always have a hope in Him. Even when things may seem so difficult and it gets difficult to hold on to your faith, know that God’s hands are always reaching out for you. We still have hope and always have hope in the promises of Christ’s return and that the struggles of this world have been overcome and that we will overcome it all too. This entry was posted in 4 Stream Blog, Spiritual Warfare and tagged 4 Pillars, Adversity, God's Love, Hope on July 3, 2014 by Richard Clinton. Everyday of our lives, we are faced with numerous battles that we must confront and deal with. Living in this fallen world, we are faced with things that try to pull us off track, challenge our faith, challenge our passion, and try to eat at our lives. These battles, if we let them, can start to tear at who we are, destroy our lives, our relationships with family and friends, and cause us to turn away from God. These can be things that simple as negative thoughts toward something or someone. It can lustful temptations of all kinds. You name, we all face it. The issue we all face is how do we deal with it. Our actions and how we decide to deal with the battles and temptations we face each day can have lasting consequences, good or bad. You may think to yourself, it’s just me, how can I have a lasting impact on others. Trust me you do. In my daily reading in Scripture this week, part of the focus is on the Book of Joshua. Joshua, led the Israelites across the Jordan River into the Promised Land, conquering Jericho and beyond with God’s angel leading the way. In Joshua 7 & 8, we learn what happens to Achan and his entire family when he sins by keeping items set aside for God. His own sins and brought death to his entire family from stoning. His sins had a lasting effect on others because he fell to worldly temptations. Going back to the article, we now look to Jesus. Often times Jesus is seen as peaceful and tranquil. However, what we do not often see taught is that Jesus was preparing us to battle the evil that will confront us daily. John 10:10, Jesus tells us the “The thief’s purpose is to kill and destroy. My purpose is to bring them a rich and satisfying life.” Matthew 10:34, Jesus says, “Don’t imagine that I come to bring peace to the earth! I came not to bring peace, but a sword.” Then verse 36, ” Your enemies are right in your own household.” Jesus came to lay down His life for us, to set us free from sin and death. His mission was to also prepare us for what we will face on a daily basis. The enemy will constantly be trying to destroy us from within. We have to take a lesson from Christ and make the choice to take up the battle for Him. If we don’t and we give in, then we face the consequences of Achan as our own sins and passivity to this world will have a lasting impacts not just on us, but on those around us. Likewise, if we choose to battle the evil of this world and battle for God’s Kingdom by proclaiming the Good News of Jesus Christ, then we can also change the world that way. We can be contagious and change the world, but we have to choose which way to go. C.H. Spurgeon said, “Look to the Cross, and hate your sin, for sin nailed your Well Beloved to the tree. Look up to the cross, and you will kill sin, for the strength of Jesus’ love will make you strong to put down your tendencies to sin.” When you find yourself faced with a challenge today or any day for that matter, look to the Cross. Jesus poured His blood out for us to be set free from sin. When trials come your way, turn to Cross. Nail them at the feet of Jesus and let Him take those troubles from you. Jesus told us in John 16:33 that we will have trouble in this world, but take heart because He has overcome this world. Jesus can take all of that trouble and those battles away. When the evil comes knocking, let Jesus answer the door. It is that simple folks. Jesus Is The Answer!!! He can pull us through every battle we face if we put our full faith and trust in Him. Trust me. He has done wonders for me and I have seen what He has done for many others who have struggled, but trusted in Him. Be a warrior for Christ and look to Him for all your troubles. He is the armor and the sword that you need. This entry was posted in 4 Stream Blog, Spiritual Warfare and tagged 4 Pillars, Adversity, Jesus Christ, Spiritual Strength on April 8, 2014 by Richard Clinton.